The statistical analysis of measurement data is important because it allows an analytical determination of the uncertainty of the final test result. To make statistical analysis meaningful, a large number of measurements is usually required. Systematic errors should be small compared to random errors, because statistical analysis of data cannot remove a fixed bias contained in all measurements. The deviation may be positive or negative. The algebraic sum of all the deviations must be zero. The average deviation is an indication of the precision of the instrument used in measurement. 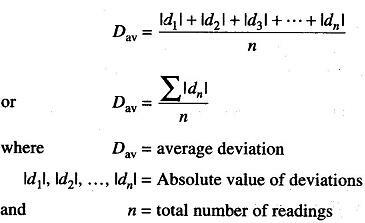 Average deviation is defined as the sum of the absolute values of the deviation divided by the number of readings. The absolute value of the deviation is the value without respect to the sign. Highly precise instruments yield a low average deviation between readings. The standard deviation is also known as root mean square deviation, and is the most important factor in the statistical analysis of measurement data. Reduction in this quantity effectively means improvement in measurement. For small readings (n < 30), the denominator is frequently expressed as (n — 1) to obtain a more accurate value for the standard deviation. Most manufacturers of measuring instruments specify accuracy within a certain % of a full scale reading. For example, the manufacturer of a certain voltmeter may specify the instrument to be accurate within ± 2% with full scale deflection. This specification is called the limiting error. This means that a full scale deflection reading is guaranteed to be within the limits of 2% of a perfectly accurate reading; however, with a reading less than full scale, the limiting error increases.